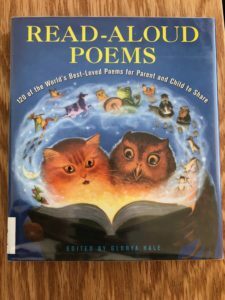 To celebrate April as National Poetry Month, I’ve been reading poetry to my boys (most of) these days. When I was shelving J 820s a couple weeks ago I picked this book up and it’s proven to be an excellent choice. It’s a great collection on a wide variety of topics from authors well known, and not. How fun to find Casey at the Bat included in the “Poems That Tell Stories” section. Many years ago I memorized this poem and recited it for a school assignment. While I only have snippets of those poetic words still stored where I can find them, I found myself standing right back in my childhood delivery of the poem when I read through the arc of the story other night – feeling all the potential for glory and the danger of conceit, as if it were mine.